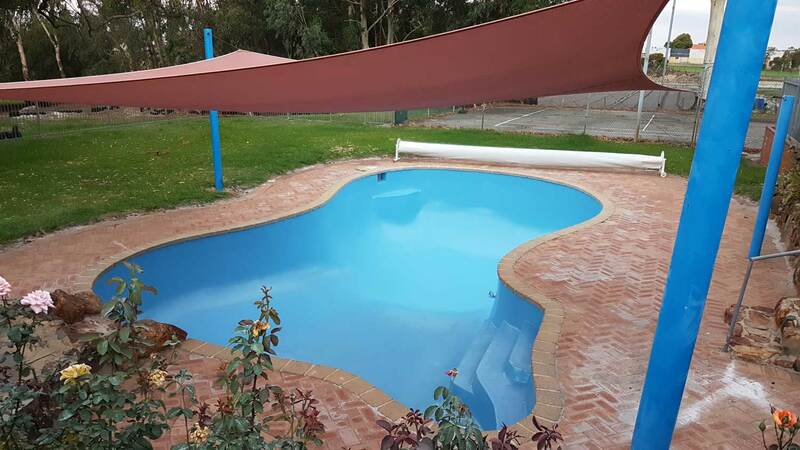 Why choose Perth Fibreglass Pools for commercial pool repairs and renovations? When the Australian summer hits, there is no greater way to beat the heat than to gather up the family and head for the local pool. But to keep these summer hotspots in the best shape, commercial and public pool providers need the right team for the job. 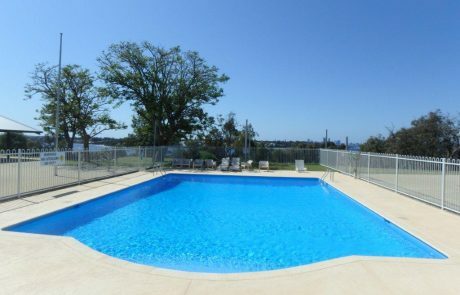 The team at Perth Fibreglass Pools specialise in installing, maintaining and resurfacing commercial-sized pools. We renovate large concrete pools with new fibreglass lining, using the latest technology in fibreglass resins and gel coat systems we can bring your pool back to life. 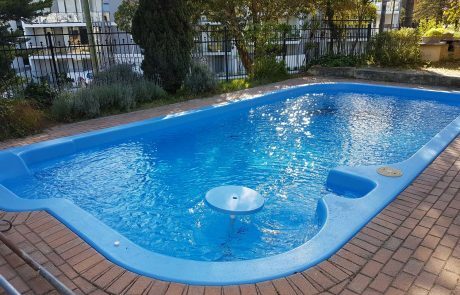 Did you know that modifying a concrete pool to fibreglass makes it much easier to clean and is by far the best way to keep chemicals stabilised? This is especially important in commercial and public pools that may see thousands of users every year. 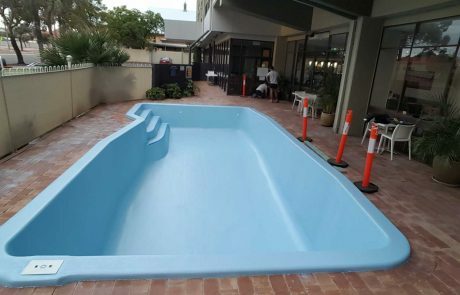 The Perth Fibreglass Pools team will complete your project to the highest standard whilst minimising disruption to your business and your guests. We have a team of trained fibreglass laminators and the latest equipment to get the job done hassle free and on time. Resurfacing and converting neglected concrete pools is our specialty. Here are just a few of our favourite success stories. 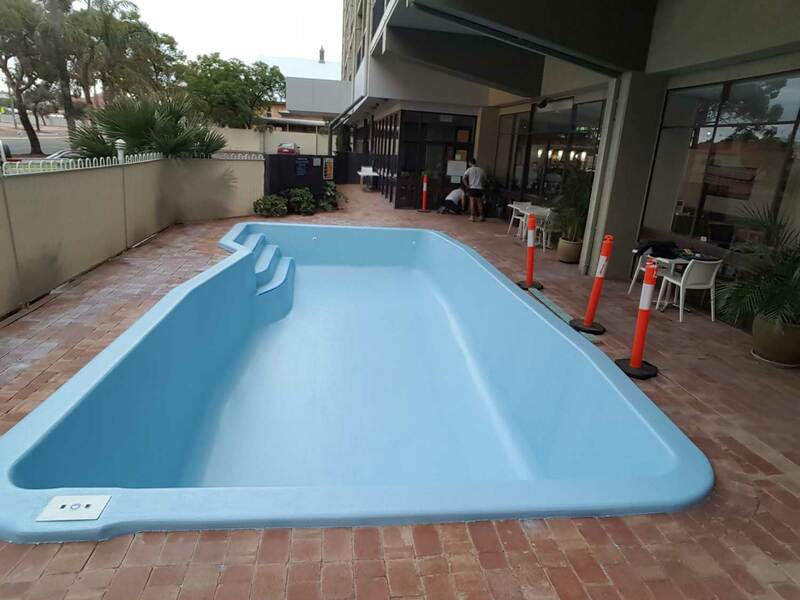 A large fibreglass pool from a large strata complex in Perth. The pool was in need of a professional renovation. It took the team at Perth Fibreglass Pools less than a week to restore this pool and bring it back to life. The concrete pool at this centre had considerable deterioration and pitted plaster work. The chemicals had become difficult to balance and the pool needed attention. 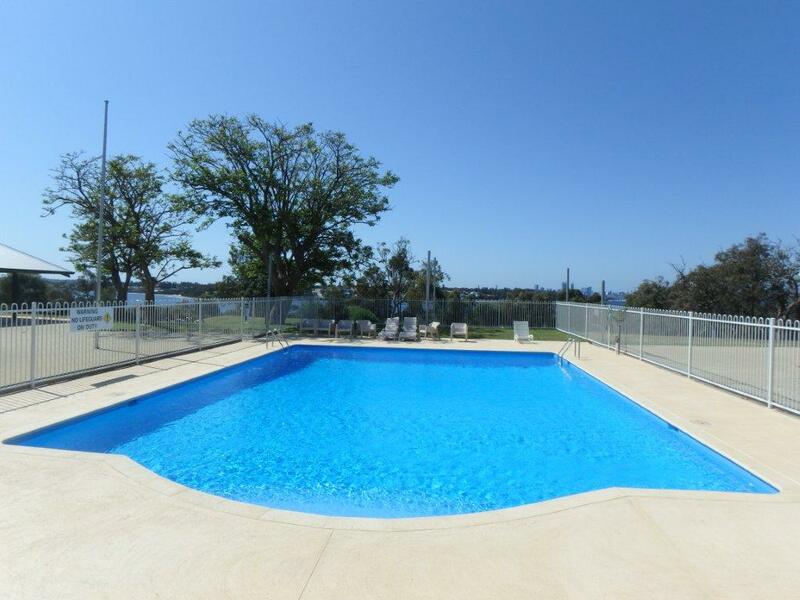 Transforming this concrete pool to a fibreglass pool was the best option and paid off. The chemical balance in the pool water is now stable and easy to clean. The new finish has brightened up the area and will last for many years to come. 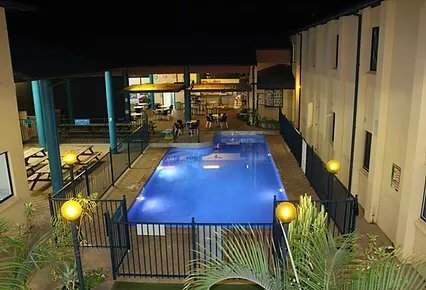 The Ibis Styles hotel swimming pool in Kalgoorlie is a 65,000 litre fibreglass pool. The pool gel coat had faded and the shell suffered from black spots and osmosis bubbles. 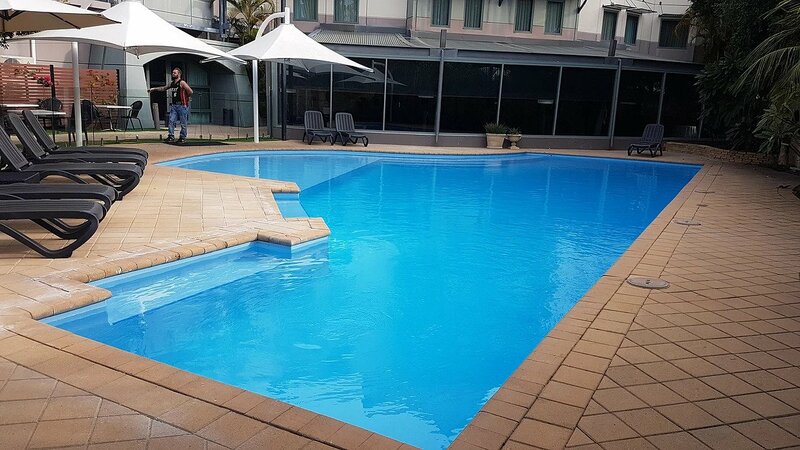 Perth Fibreglass Pools renovated the pool to a high standard with minimal disruption to the running of the hotel. The colour is Athol Blue. This 95,000 litre pool in WA’s North West had suffered storm damage. The vinyl liner had pulled away from the walls and ripped in places. 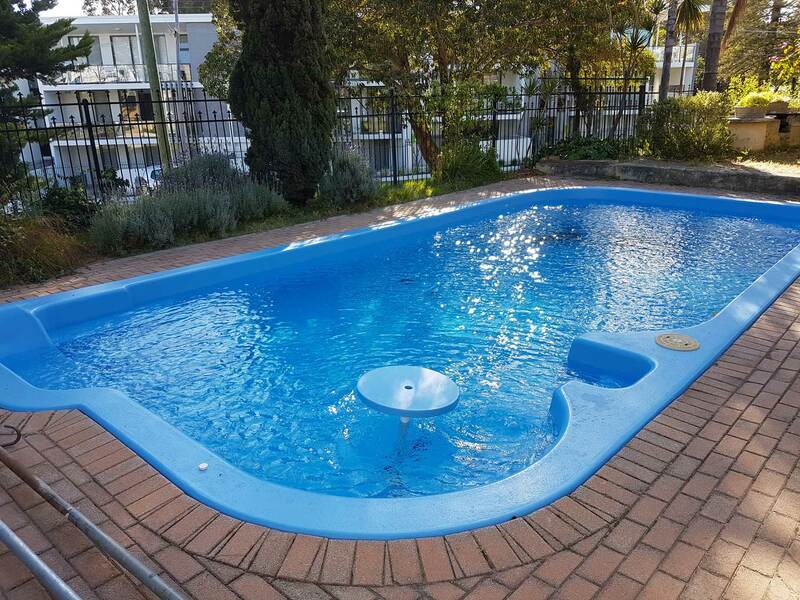 The team at Perth Fibreglass Pools traveled to Coral Bay and repaired the concrete shell. We added multiple layers of fibreglass to form a new solid fibreglass shell. We added a new LED pool light and finished the pool with Aquaguard Sapphire Blue gel coat. A large 170,000 litre concrete swimming pool that had previously been painted. The plaster work had failed and the paving had deteriorated, effecting the pool walls. 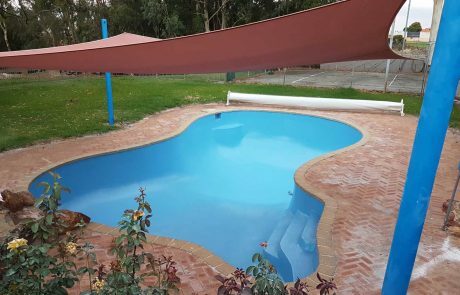 Perth Fibreglass Pools fixed the walls and tiles with new concrete form work, relined the pool with a strong fibreglass shell and finished with an Aquaguard gel coat system. 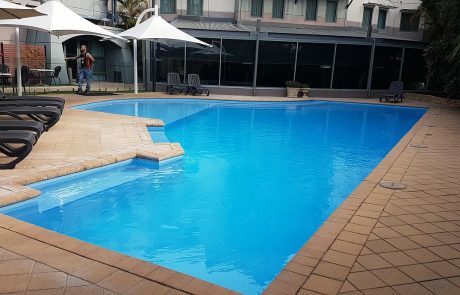 The team at Perth Fibreglass Pools renovated this tired 130,000 litre concrete pool in Como, Perth, belonging to the prestigious Pagoda Resort and Spa. The concrete render had cracked, bubbled and pitted in most places around the pool surface. The team striped back the old surface and applied a new fibreglass layer throughout the entire pool. Full Aquaguard resurfacing gel coats were correctly applied which will gave this old pool a new lease of life. The colour is Lagoon Blue which is recommended for this class of commercial pool and matches WA leisure industry standards. This pool is also featured in the WA Pool and Spa magazine.